Petition from Howard University students in Washington, District of Columbia, to the Governor of the State of Alabama in Montgomery, Alabama. This petition from students at Howard University protests the "deplorable miscarriage of justice" in Haywood Patterson's 1933 trial in Decatur before Judge Horton. The petition includes seven pages with approximately 50 signatures on each page. 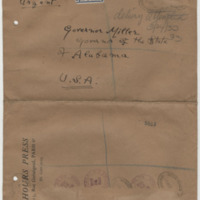 Petition from Nancy Cunard and well known London and Paris-based artists and intellectuals in London, England, to Governor Miller of Alabama. 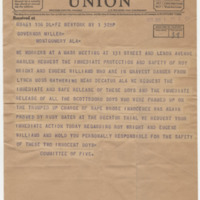 Petition from International Labor Defense in Seattle, Washington, to Governor B. Miller in Montgomery, Alabama. 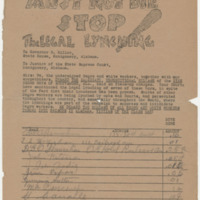 This petition from International Labor Defense in Seattle, Washington, demands the immediate release of the nine Scottsboro Boys with signatures, addresses, and donation amounts. 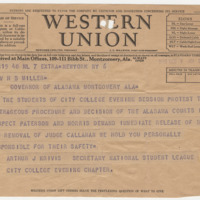 Telegram from National Student League City College Evening Chapter of New York in New York, New York, to Gov. 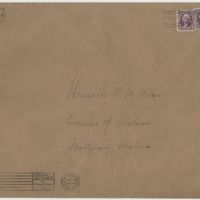 H. B. Miller in Montgomery, Alabama. 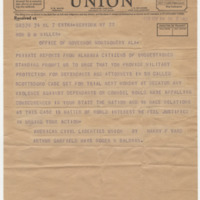 Telegram from the American Civil Liberties Union in New York, New York, to Hon. B. M. Miller in Montgomery, Alabama. 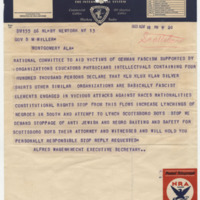 Telegram from National Committee to Aid Victims of German Fascism in New York, New York, to Governor B.M. Miller in Montgomery, Alabama. Telegram from the International Labor Defense in New York, New York, to Governor B.M. Miller in Montgomery, Alabama. 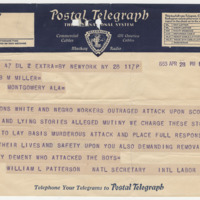 Telegram from workers in a mass meeting in Harlem in New York, New York, to Governor Miller in Montgomery, Alabama. 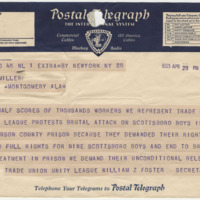 Telegram from the Trade Union Unity League in New York, New York, to Governor Miller in Montgomery, Alabama. Telegram from International Labor Defense in New York, New York, to Governor B.M. Miller in Montgomery, Alabama.